I used to think that music needed to have lyrics in order for it to have meaning, but I developed an appreciation for instrumental music through listening to post rock and found that you don’t need words to express something. The emergence of post rock (gaining prominence in the late 1990s and early 2000s) has been viewed as a reaction against rock music, particularly the mainstream's commercialisation and co-opting of alternative rock, where it had became formulaic and ceased to mean anything anymore. Post rock subverts and rejects typical rock conventions, breaking away from standard song formulas and the ‘macho’ aesthetic. It’s generally instrumental and has been described as music “using rock instrumentation for non-rock purposes, using guitars as facilitators of timbre and textures rather than riffs and power chords”. Texture, tone and atmosphere have more of a prominent role in post rock than hooks, verses and choruses. With the absence of vocals, the music itself becomes the primary focus and supplants lyrics in engaging listeners. When vocals are used in post rock, it’s an extension of the instrumentation, adding texture and melody to the overall song. Take a band like Sigor Ros for instance, where songs are sung in an ethereal falsetto, in an ‘invented language’ Vonlenska, also known as Hopelandic, which acts as another instrument to drive the sound of Sigor Ros. The musical qualities of the vocals are absorbed, not its meaning. To me this is the beauty of post rock, where the interplay and dynamics between the instruments create a song that can bring up feelings, images and experiences that have the ability to transport you somewhere for the time you are listening to the song. There is something truly mesmerizing about music that leaves a mark on you without the use of words. Slow braising is my favourite way of cooking meat. Nothing beats the taste and texture of meat that has been cooked for so long that it falls apart and literally melts in your mouth. Braising also brings out an incredible depth of flavour in the meat as overtime it is slowly infused with the flavours of all the other ingredients. In On Food and Cooking, McGee looks at how the quality of meat and our approach to cooking it has changed over the last few decades due to the mass industrialized production of meat, driven by efficiency and affordability. Meat has become immature in that it is grown and slaughtered in the shortest possible time. Movement is minimized, the muscles are not worked, resulting in more tender meat with flavour that is not as developed. The required cooking time for modern industrially produced meat is shorter and the packaged cuts you get at the supermarket are generally leaner and based on ease of preparation (ie: fast). Back in the day, animals led a full life - kept for work to plough the fields and as a mode of transport etc. and were slaughtered for food after they had outlived their usefulness. This meant that meat was mature, tough and strongly flavoured, and slow cooking was used to soften and tenderize tough cuts of meat. People used to spend hours cooking! These days people are cooking less often as their lives are busier, the rise of two-income households can mean that neither partner has the time or energy to cook. There is a growing ‘cheaper, faster trend’ with a number of shortcuts, premade meals, packet seasonings to make meals easier and quicker to prepare. 30 minutes. 15 minute meals. 5 ingredients, 4 ingredients recipes. How much less time can do you want to spend in the kitchen? How minimal can your meal be? This is something that Michael Pollen explores in his recent book Cooked, where he believes that the art of cooking is being lost, and lack of time spent on cooking is also resulting in us loosing connections with our food and understanding of it, as well as the connections to the people that we share food with and our lives. One factor that he attributes this development to is the rise of convenience food in the growing post World War II industrial food system, where food corporations are increasingly promoting packaged food products as quick and easy food solutions to the domestic market, especially as housewives and women were moving into the workforce. Cooking, if you want to do it justice, can be time consuming. An example that Pollan uses is onions, where he admits to never giving onions enough time. If you want to get beautifully caramelized onions, you need to be cooking, sweating them, stirring and waiting 40 minutes for it. Who has the time to wait more than 10 minutes for onions to cook? It’s easy to be impatient. But then Pollan lets himself ‘be’ in the kitchen, to be disconnected from his computer screens and take the time to connect with his senses and family while cooking. The more Pollan cooked, the more he changed his outlook to it. Cooking is time-consuming, it requires you attention and effort, it’s varied, challenging and highly rewarding. In the sense that our food habits are infiltrated by commercial and corporate interests, as alternative rock music has; and we live in times where we are encouraged to do things fast and furious; slow cooking, like post rock, would be taking a step back from the state of things to slow down and spend a little more time to appreciate the wonders of cooking/music and how it all comes together, to allow yourself to be lost in the method/song compositions, the textures of the sounds/ingredients and surround your senses – smell, sight, sound…. they both provide a sensory assault that is long and drawn out. When I think about post rock, I see many similarities with slow braising. To embrace post rock or slow braising you need time and patience. Slow braising is done by cooking tougher cuts of meat, partially covered with liquid, slowly for a long period of time at a low temperature. Overtime, the connective tissues and fibres of the meat break down so that it pulls apart easily and the collagen melts, turning into rich liquid gelatine, giving the meat flavour, making it tender and succulent. Similar to the composition of a post rock song, slow braising is about developing and layering flavours. Typically the meat is first seared at a high temperature to brown and caramelize it, causing the Maillard reaction. Then some or all of the following things can be added - various aromatics like onions, garlic, leeks, carrots and celery are sautéed, wine/liquid is added to deglaze the pan to get the tasty bits stuck on the bottom of the pan into the dish, other vegetables are added for flavour like tomatoes, then seasonings, herbs and spices, and water or broth is added to partially cover. The heat is reduced to a simmer for hours, allowing the meat to slowly braise and become tender, and for all the ingredients to slowly impart their unique flavours to the dish, adding layers of depth. So you have to be patient when slow braising, you can’t hurry the process up, time is needed to develop flavours and make the meat tender. Just as you have to be patient when listening to post rock, as the songs are generally lengthy instrumental pieces that layers riffs and plays with dynamics to create soundscapes that tend to evolve to a crescendo or climax. You need to give yourself time to allow the song to build up in order to appreciate how the song intricately evolves and unfolds. Most people would be used to listening to songs that don’t go any longer than 3 minutes, I love songs that go for 10 minutes! Post rock music also has a cinematic quality, especially the work Godspeed You! Black Emperor. Their music is often described as a sad and beautiful soundtrack to urban decay. The compositions of their songs tell stories of destruction, plight, mourning and uprising with an underlying message of hope. The music is moving, it effectively evokes images, builds tensions and creates shifts in moods. Sometimes it feels like you have sat through a film and have been taken on a journey while listening to Godspeed You! Black Emperor. The use of visuals with 4-projector 16mm projection of films and loops at their live shows further build upon their cinematic aesthetic. For a lot post-rock bands, films are a source of inspiration for recording music and a driving factor in the way they approach working on a record. Many post rock bands like This Will Destroy You, Godspeed You! 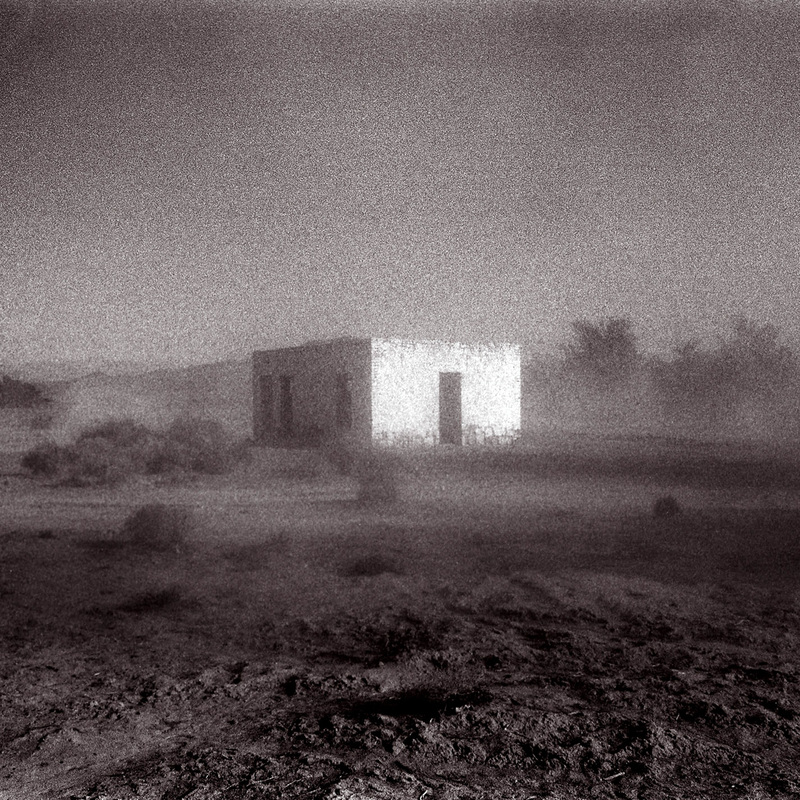 Black Emperor and Sigor Ros have had their music featured on soundtracks or scored music for films. I find post rock more of a soundtrack for cold winter nights and this kind of weather makes me want to braise… to set myself in a rhythm of chopping, dicing, searing, stirring, adding, seasoning and balancing, and then turn on my oven for hours. While the oven is slowing cooking my meat, breaking it down and developing layers of flavours, my kitchen is filled with warmth and I am wrapped up in lovely aromas that grows overtime as the meat reaches a state of forgivingness. I find it comforting listening to post rock and there is nothing more comforting than tucking into a slow braised dish on a cold winters night! 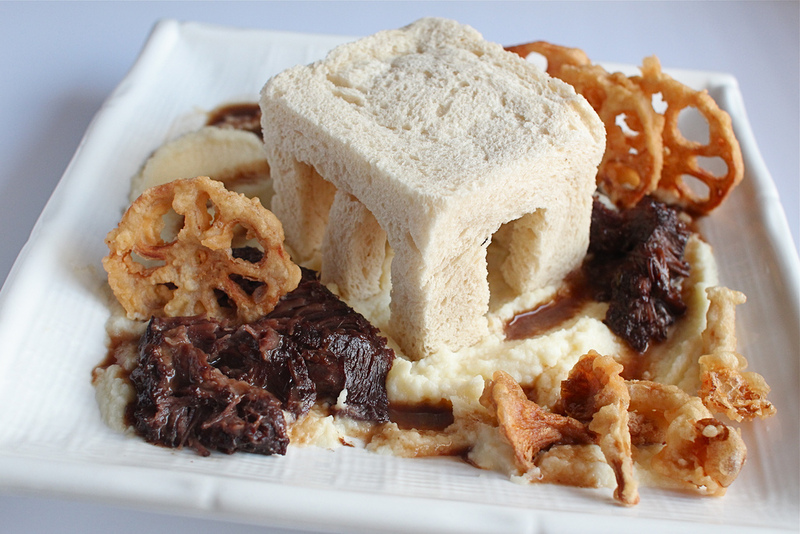 Here I present to you my post rock influenced slow braised dish inspired by the cover of Allelujah! Don't Bend! Ascend! by Godspeed You! Black Emperor. 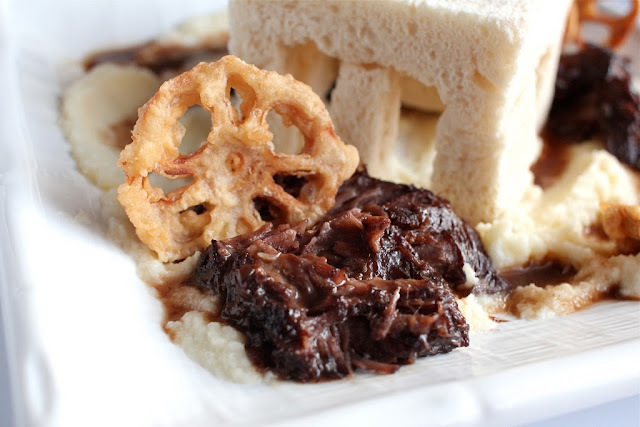 To finish the dish I sporadically scattered torn pieces of beef cheeks that I had slowly braised in my oven for 5 hours. Yes! Trim the beef cheeks and season with salt and pepper. Heat olive oil in a dutch pan and when it’s hot, add the beef cheeks and sear for a few minutes each side until it’s browned all over. Remove and set aside. Heat up a little more olive oil and add carrot, garlic, leek, celery, shallots and sauté for 5 minutes until browned and caramelised. Add thyme, bay leaf, wine and simmer to deglaze and reduce the liquid by a third. Return the beef cheeks to the dutch oven. Bring the beef stock to boil and pour over the beef. Cover and cook in the oven for 4-5 hours until the beef cheeks are tender and pulls apart easily. 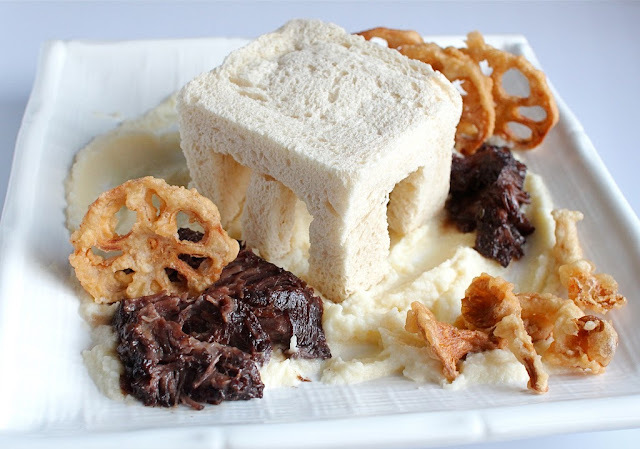 Tempura – refer to Just One Cookbook. Egg. Check. Pork. Check. Some sort of cereal grain…Rice. Check. I think this qualifies as a breakfast fry up! Well an Asian breakfast fry up. Thai style. 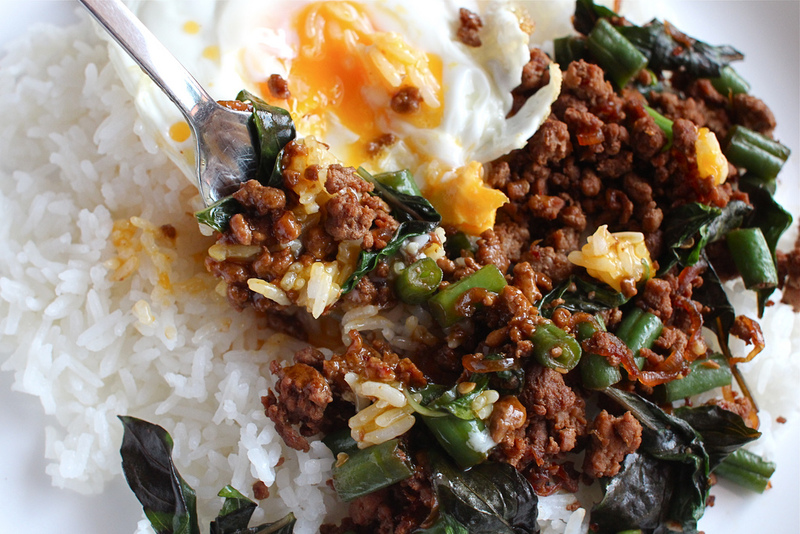 It’s basically a pork mince with Thai basil leaves stir fry on rice, with a fried egg on top. It’s really easy to make. That fits the criteria for breakfast right? And the aromatics from the Thai basil and heat from the chilli will definitely wake you up! Perfect for a hangover. Another breakfast tick of approval. Contains an egg with oozing yolk. Money shot! Most importantly, it’s a delicious start to the day. The rice thing might put some people off though. But not me. I love eating rice, it's my daily staple. I can eat it for breakfast, lunch and dinner, all day, every day. I get referred to as the fan tung aka rice bucket in my family, a Cantonese saying for someone who eats a lot of rice. I prefer it over bread and enjoy rice dishes for breakfast more than anything else. 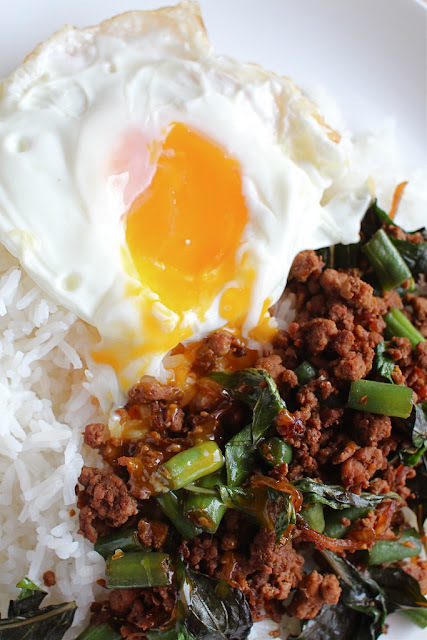 This is a common fast food dish in Thailand. It's really fast to make, so you will find it everywhere in Thailand where street stalls and restaurants can whip it up for you real quick. 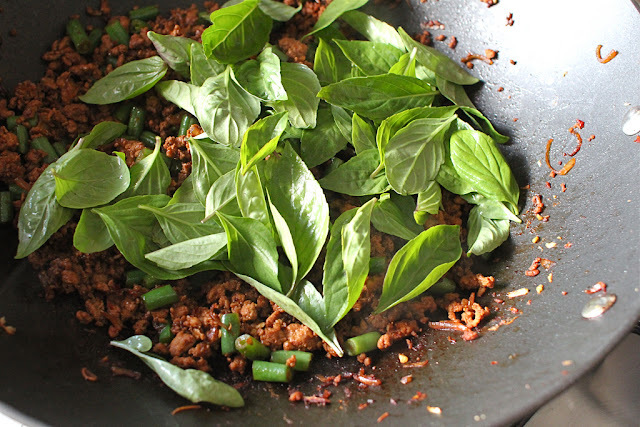 In Thailand it’s called pork pad ka-prao aka pork stir fry with holy basil, but holy basil can be hard to find outside of Thailand, so you can use the regular Thai basil but the dish will be called pork pad bai horapha aka pork stir fry with Thai basil. It’s same, same but different. 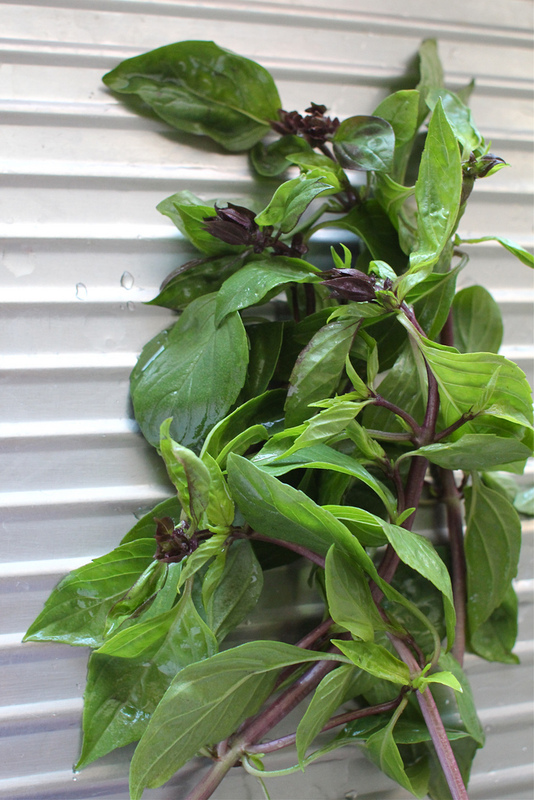 Thai basil is more licorice-y while holy basil is spicier, peppery with a hint of citrus and mint. The defining characteristic of this dish is provided by the basil - holy basil and in a lot of the recipes that I’ve come across for it, it’s often called pork pad ka-prao as that’s what it’s commonly know as, even when Thai basil is used. So unless you are using holy basil and for most you might not have access to it, then you are naming it wrong! In the end it doesn’t make a difference as using either basil will give you a tasty result but it’s like white chocolate cannot really be called ‘chocolate’ because it does not contain any cocoa solids…and a burger without meat in it isn’t really a burger as burger is short for hamburger…. I love that this dish comes with a fried egg on top, sunny side up as some would say. This is the most common way of cooking eggs in my family. It’s really easy as all you need is a pan/wok of really hot oil, so hot that when you crack the egg in it sizzles and in a few moments the egg whites puff up and blister, the edges turn crispy and form a brown frame while the yolk remains untouched and you get a creamy runny centre. I think fried eggs rule over poached and scrambled eggs, what do you think? 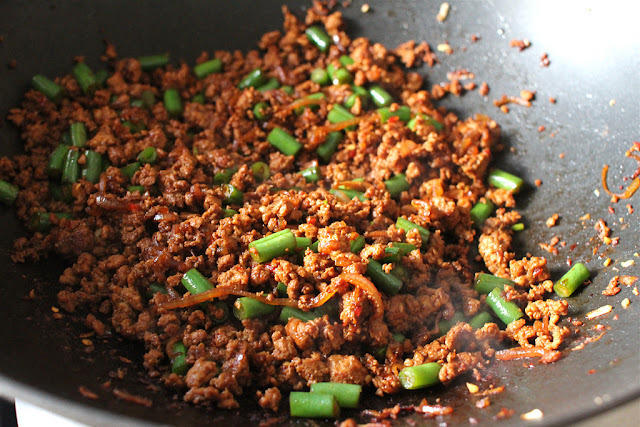 Heat 2-3 tablespoons of vegetable oil in a wok, add pork mince and stir fry until it changes colour. 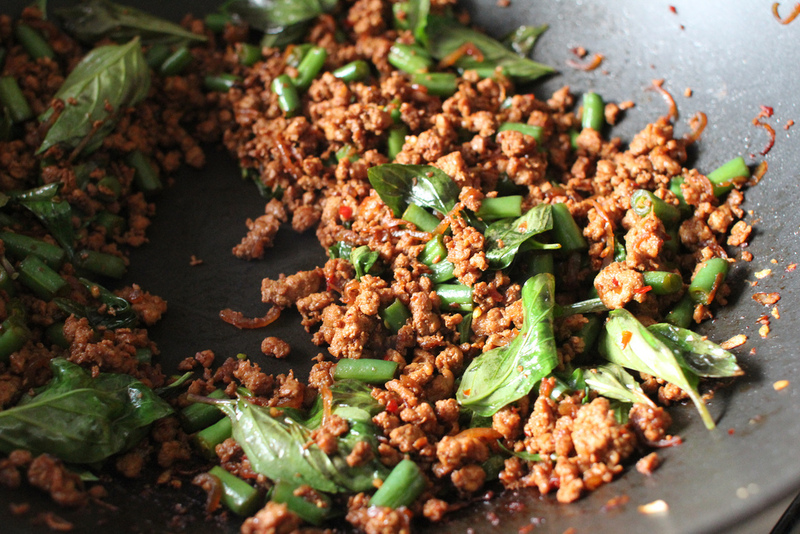 Then add in the garlic, sambal oelek and fry together with the pork until it browns. Add in the sliced shallots, snake beans and stir fry until the shallots soften. Add in the fish sauce, dark soy sauce, kecap manis and oyster sauce, stir fry everything together for 2-3 minutes and season to taste with salt and pepper. Add in the Thai basil, turn off the heat and stir through until it wilts. 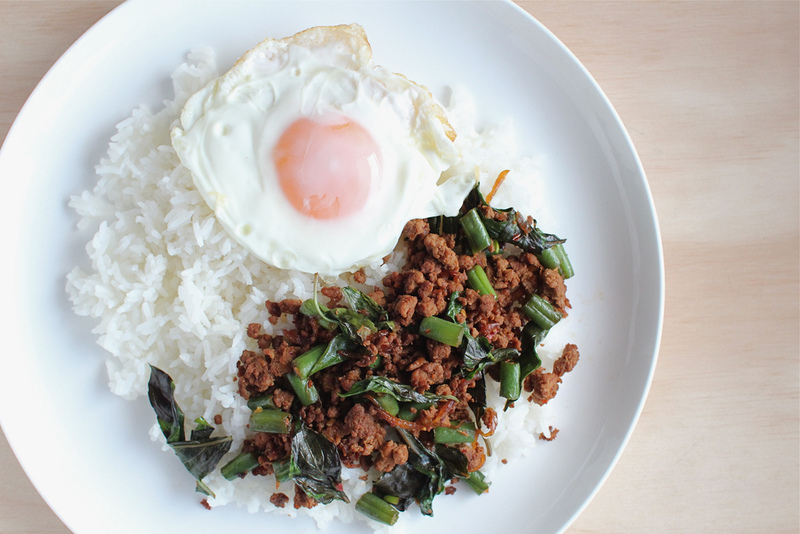 Serve over steamed rice and a fried egg on top. I remember when the Secret Cake Club Perth was the Clandestine Cake Club Perth. Back then it was just a few food bloggers hanging out together sharing cake. With too many rules (ie: no cupcakes, muffins, brownies, pies or tarts) and some “words” from the founder of the Clandestine Cake Club in the UK after seeing a photo tweeted of an event we had in Perth, where small individual cakes were presented rather than a whole cake (ahem), a decision was made by Carolanne (Carolanne's Kitchen) and Jacqui (Pantry in Suburbia) who started the Clandestine Cake Club Perth to split from Clandestine and create a club where the size and form of your cake did not matter. So Mark II, the Secret Cake Club Perth was born where the basic rules of there being a theme and a secret location that isn’t revealed until a day or two before the event remains the same, but there are no rules on what you can bring. A new theme is announced every month and now the possibilities of what you can make are endless – savoury, sweet, baked, unbaked, whatever…it’s all good. Overtime it has been amazing to see Secret Cake Club Perth grow with more people attending and now the location is moving out from people’s dining/lounge rooms to different cafes in Perth and the next one is at a bar! The last Secret Cake Club Perth in July was the largest so far with 27 cake clubbers in attendance but this will be surpassed by the next Secret Cake Club coming up on the 18th of August, which over 40 people have signed up for. Registrations filled up so quickly I even missed out! It can be easy to get complacent in Perth, I know my friends and I often joke about how you don’t have to get a ticket to a gig until the last minute because things in Perth don’t sell out, but lately I’ve noticed that times are changing and you definitely have to be quick off the mark! It’s great that there are more cake clubbers now, it means more treats and more eaters every time. I remember the days when it was just 5 cake clubbers and we each bought a cake and each tried to eat the equivalent of a cake! Now with so much more choice, you strategically select which ones you will try on the day as there is only so much cake you can eat in the space of 2 hours and then fight over the leftovers to take home. Give me a bucket of chips, a bucket of chicken wings, anything savoury and I could eat the lot. Give me a plate of cake and I would struggle to get through it. Salt wins over sugar. Even though there are no rules on what you can bring to cake club now, baking sweets is always the majority, the savoury options are rare. I guess there is nothing quite like sharing cake, especially a freshly made one. And the process of making it….magic happens as butter, eggs and flour are transformed by heat into something that is really pleasing. Especially during winter, the oven is just calling out to be used for baking so that it not only keeps your kitchen warm but fills it up with sweet aromas. Eating cake is also a happy experience, you can’t be sad if you are eating cake. 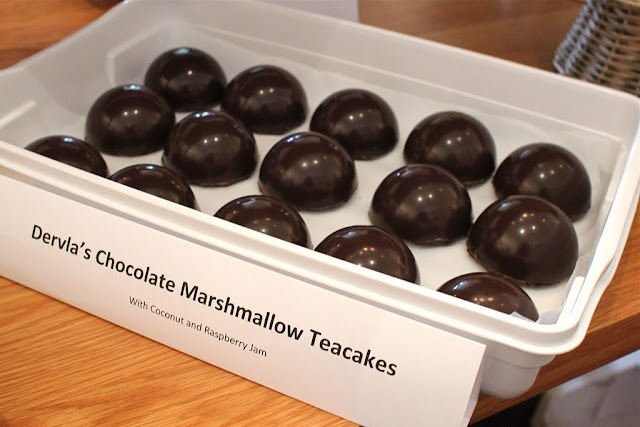 The theme for the July Secret Cake Club Perth was ‘Cup ‘O Joe’ - so basically anything with coffee or tea, or anything that goes with a cuppa. So I decided to do both. I baked green tea almond biscotti. 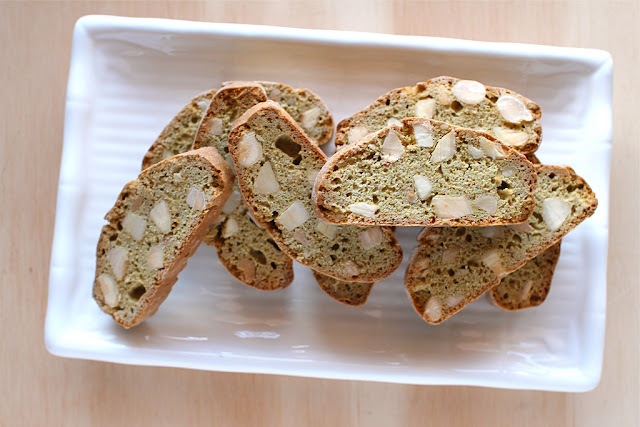 Biscotti are twiced baked biscuits, making them dry and crunchy, and perfect for dunking into coffee. With the addition of green tea matcha powder, it’s even better with health benefits and I love the flavour and colour matcha brings to goods. 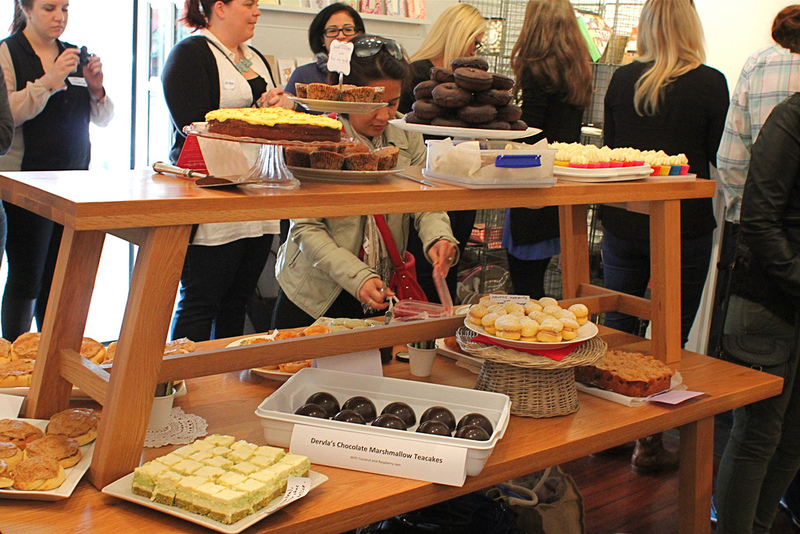 July Secret Cake Club Perth was held in the upstairs room of Studio Bomba. My favourite treats from ‘Cup ‘O Joe’ Secret Cake Club Perth were Dervla’s Chocolate Marshallow Teacakes, which was like a wagon wheel but better. 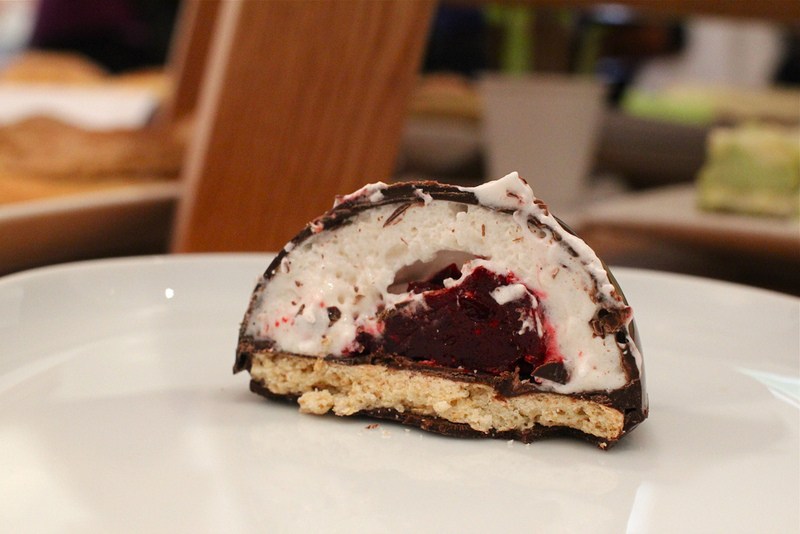 Dervla always brings treats to cake club that are next level. Can you believe that it was her first time ever tempering chocolate, check out the shine on the spheres! 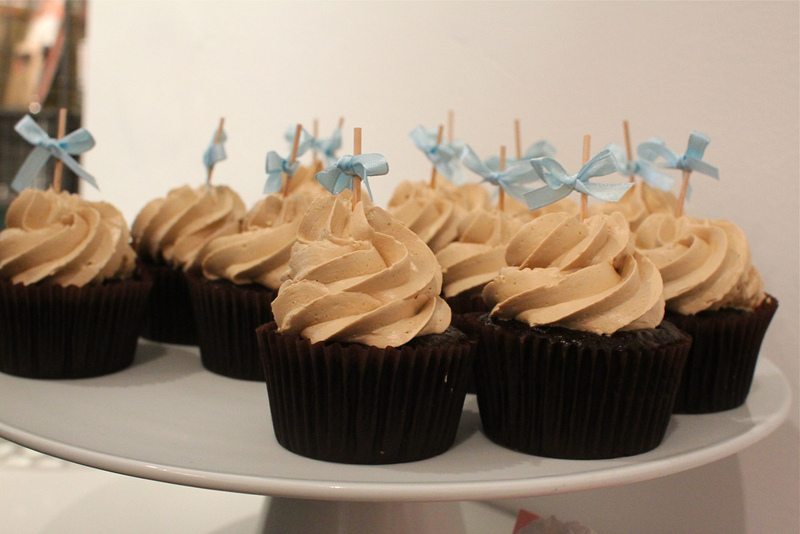 And these mocha scented cupcakes filled with a chocolate ganache and topped with a coffee flavoured Italian meringue buttercream were delicious and every element of this cupcake was faultless. So good that I made sure I reserved one in my container to take home. Preheat oven to 175C and roast the whole almonds for 8-10 minutes until lightly browned and fragrant. Let cool, coarsely chop and set aside. 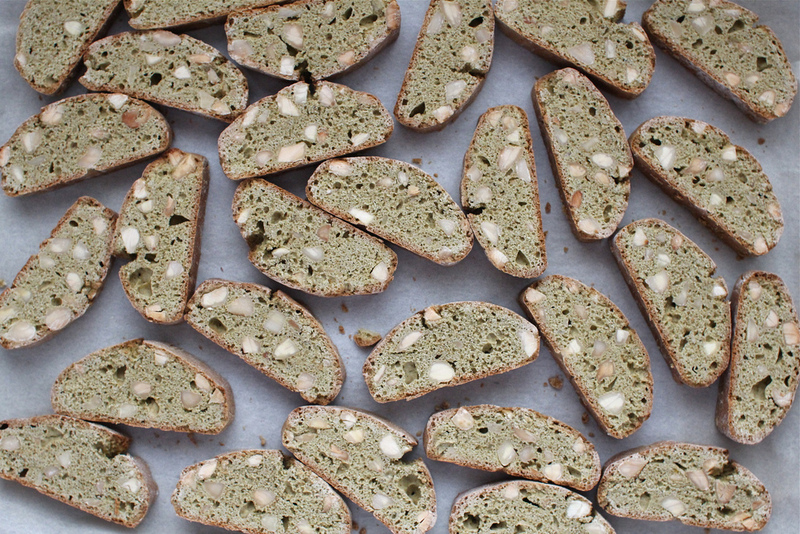 Shift together the dry ingredients in a bowl – flour, baking power, salt and green tea matcha powder. Beat the sugar and eggs in a bowl for 5 minutes until it’s thick. Add the vanilla extract and beat to incorporate. Add in the flour mixture and stir with a spatula to combine, then fold in the chopped almonds. On a lightly floured surface, turn out the dough and lightly knead until it is smooth. Divide the dough in half and roll to form a log and shaped using floured hands into a flat rectangle that is about 5-6cm in width and 1.5cm high. Transfer the logs to the baking trays. Bake at 175C for 20 minutes until light brown and firm to touch. Remove from the oven and let cool for 15 minutes. Transfer the logs to a cutting board and cut with a sharp knife into 1.5cm slices. Reduce the oven temperate to 150c, place the sliced biscotti onto the baking tray and bake for 7 minutes, take out and turn the slices over and bake for another 7 minutes.